The aim of this workshop is to review current progress and future trends in the development of computational methods for analysis and interpretation of experimental data for biomolecules, including protein machines. The challenges brought by novel single-molecule experimental techniques, such as High-Speed AFM, shall be extensively discussed. The number of participants in this workshop is limited to 25 due to the size of the reserved conference room. Therefore, the workshop is mostly by invitation. However, a few external applications may be accepted too. If you are interested, please contact Dr. Holger Flechsig (WPI-NanoLSI) until September 15 and provide the following information: Name, affiliation, position, research interests. We will inform you about the acceptance before September 30. Interaction between transcription factors and the nucleosome studied by molecular dynamics simulations. The workshop will take place in the historical building of the Fourth High School constructed in 1891. 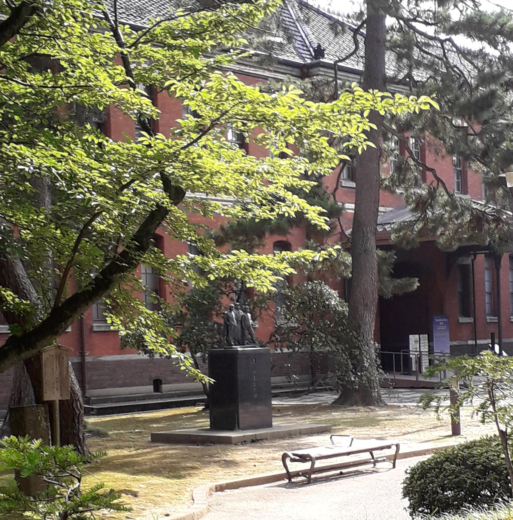 Today it accomodates The Fourth High School Memorial Museum of Cultural Exchange and The Ishikawa Modern Literature Museum. This building is located in the center of the city, next to the Kanazawa castle. The conference room is Room 4 on the second floor. Please take a KANAZAWA LOOP BUS (Left Loop) at Kanazawa Station East Gate Bus Terminal #7 or Line 18 (Terminal #3), Line 13 or 90 or 92-95 (Terminal #6), Line 30-33 or 35 (Terminal #8), Line 41 or 42 or 44-46 (Terminal #9), Line 20-22 (Terminal #10) , or Line 51 or 54 or 56 (Terminal #11), and get off at Korinbo bus stop. It takes about 10 minutes and the fare is 200 yen.